To Cite: Shafi H, Darzi A, Kamali Ahangar S, Asghari Y. Non-Operative Management of Intraperitoneal Bladder Rupture Due to Blunt Abdominal Trauma, Trauma Mon. 2017 ; 22(5):e38079. doi: 10.5812/traumamon.38079. 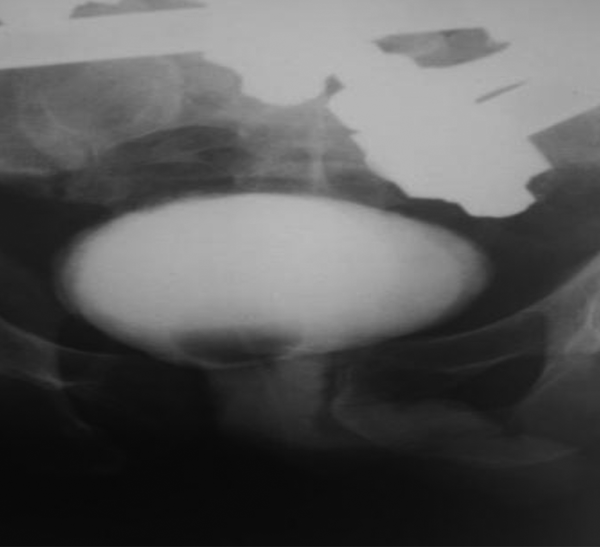 Introduction: Nowadays, surgical treatment is the gold standard to manage traumatic intraperitoneal urinary bladder rupture; there is an increasing trend of conservative management in cases of urinary tract trauma. Case Presentation: A 72-year-old male with high energy trauma due to car accident had blunt traumatic intraperitoneal urinary bladder rupture with pelvic fracture. He was successfully managed non-operatively by catheter drainage of the bladder and external fixation of the pelvic fracture while he was hemodynamically stable and there was no other organ injury. Conclusions: Non-operative management for a blunt traumatic intraperitoneal bladder rupture with pelvic fracture is an important treatment modality if a laparotomy is not needed for any other abdominal organ injuries, and urine can be constantly drained through a catheter; and a close surveillance can be performed for generalized peritoneal signs and uroascites. Bladder rupture may occur by external trauma, iatrogenic trauma or spontaneously. A full bladder is more likely to become injured than an empty one (1). Blunt traumatic bladder injury is often detected in association with a severe pelvic fracture and it may be implicated when significant morbidity and mortality occur due to concomitant injuries (2). Bladder injury is classified as extraperitoneal rupture (EPR) or intraperitoneal rupture (IPR) (2, 3). Most extraperitoneal bladder ruptures are managed non-operatively by catheter drainage as a standard approach (4-6). Whereas surgical repair is the recommended treatment for IPR, on the other hand, a blunt traumatic intraperitoneal bladder rupture should always be sutured water-tight and decompressed by a transurethral catheter and/or a suprapubic catheter (3, 5, 7-9). However, there is an increasing tendency toward conservative management in cases of genitourinary trauma (1). The current paper presents a case of a blunt traumatic intraperitoneal bladder rupture with pelvic fracture, which was successfully managed non-operatively. A 72-year-old male with high energy trauma due to car accident, was transferred to the emergency department of Shahid Beheshti hospital affiliated to the Babol University of Medical Sciences, Babol, Iran. He was conscious, and had no respiratory complaint. He had severe lower abdominal and pelvic pain. There was no external bleeding. His vital signs were as follows: blood pressure (BP): 100/60 mmHg, pulse rate (PR): 90/minute, respiratory rate (RR): 22/minute. After primary assessment and resuscitation, positive finding at clinical examination was tenderness of hypogastrium and pelvic girdle. The focused assessment sonography for trauma (FAST) was negative for free abdominal fluid, but there was some pelvic fluid around the bladder. The urine was hematuric. Abdominopelvic computed tomography (CT) scan demonstrated bilateral pubic fracture and extravasation of contrast media from the urinary bladder to the peritoneal cavity, with no other signs of solid organ and hollow viscus injury (Figure 1A and 1B). There was no bony fragment in the bladder. 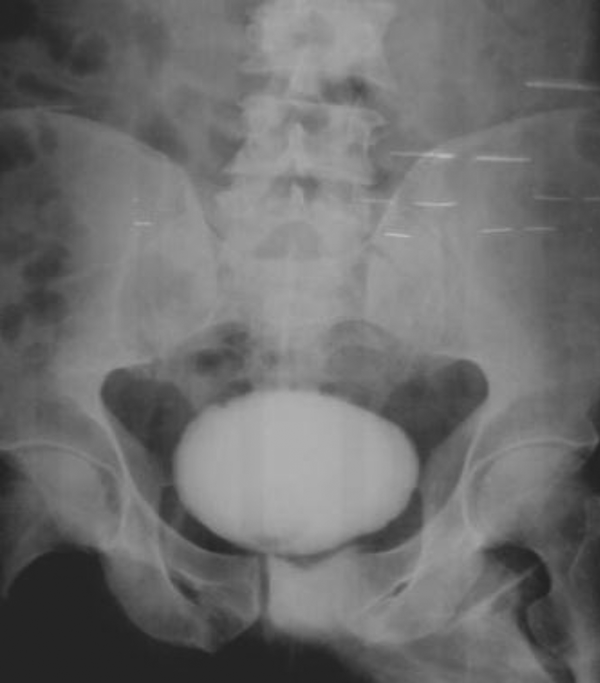 Retrograde cystography confirmed intraperitoneal bladder rupture. After an external fixation for the pelvic fracture, it was decided to manage his bladder injury conservatively at the surgery intensive care unit (SICU), since he had stable hemodynamic condition, his abdomen was soft at serial examination, urine was drained properly via the catheter, and a surgical repair of the bladder would probably have induced bleeding from a severe pelvic fracture. Conservative non-operative management was continued due to the following reasons; 1) little risk of infectious consequences due to good urine drainage; 2) it was considered that a surgical repair likely results in infection and bleeding. During the observation period, urine was constantly drained by a transurethral catheter, and no intraperitoneal fluid was observed. One week after admission, retrograde cystography was performed. No leakage of contrast medium was detected (Figure 2). Conservative non-operative management was thus continued. After two weeks another retrograde cystography was performed and no leakage of contrast medium was observed (Figure 3). After satisfaction with bladder healing, according to the imaging and good urine drainage on day 14, the catheter was removed and the patient was later discharged in good condition. The most common cause of bladder rupture is trauma (96%), which includes blunt, penetrating, and iatrogenic injuries. Other causes are spontaneous rupture (< 1%) and intoxication (2.9%). EPR occurs in approximately 60% - 65% of cases, and IPR in 25% (3, 7). Over 80% of patients with bladder rupture also have pelvic fracture, bowel injury or intraperitoneal solid organ injury (10). Intraperitoneal ruptures occur since rapid rise of intraperitoneal pressure causes bladder burst (4). Evidence for this mechanism is that such injuries overwhelmingly involve the dome, suggesting that the bladder bursts along the area of the least resistance (5, 11). Extraperitoneal ruptures, in contrast, are thought to result from direct laceration, usually by bone spicules from the fractured pelvis. Some centers have supported this hypothesis by reporting that the location of extraperitoneal ruptures corresponds to the site of pelvic fracture in a majority (35/39) of patients (12); although a study only observed this correlation in 35% of the patients (7). Intraperitoneal ruptures require open operative repair with two-layer closure with absorbable suture. Several factors support this method: they are often much larger than suggested on cystography and are unlikely to heal; if conservative management is attempted, persistent urinary leakage can ensue and may result in electrolyte abnormalities (hyperkalemia, hypernatremia, uremia and acidosis) and fatal peritonitis (3, 4). Although an extraperitoneal bladder rupture is often managed non-operatively by simple catheter drainage (4-6), an intraperitoneal bladder rupture is almost always treated by a surgical repair and decompression by a transurethral catheter and/or a suprapubic catheter (5, 7, 8, 13). Although previous reports described successful conservative management of intraperitoneal bladder rupture cases, they were all cases with iatrogenic injuries (2). However, since a blunt traumatic intraperitoneal bladder rupture usually includes extensive lacerations (4), non-operative management is attempted in few cases according to the literature review. In the 1970s, Mulkey and Witherington, Richardson and Leadbetter, and Robards et al. published three papers (case reports) on the non-operative management of IPR and concluded that surgical repair might not be the only choice. These were the earliest trials of non-operative management in IPR. In 2002, Pansadoro et al. (14) reported the successful management of two cases of IPR following transurethral resection of bladder tumor using intraperitoneal and transurethral Foley catheters in situ. In 2003, a similar management of three cases of massive fluid extravasation into the peritoneal cavity after transurethral resection of bladder tumor was described (15). Basiri and Radfar claimed that they had conservatively treated, for the first time, a case of spontaneous intraperitoneal rupture of the urinary bladder due to prostate cancer (16). Osman et al. also performed a study on eight pediatric patients with post-traumatic IPR, in which the patients were grouped equally for open surgical repair and conservative treatments (17). All of the children receiving conservative treatments demonstrated significant improvement in general condition within a few hours of the bladder and peritoneal drainage. Intraperitoneal tube drains were removed after 1 - 4 days. There were no post intervention complications and surgical treatment was never required. The mean indwelling catheter duration was 11.8 ± 2.6 days (3). In the current case, there were three important aspects regarding non-operative management: 1) stable hemodynamic condition; 2) no abdominal signs at serial examination; 3) proper constant urine drainage by catheter. Hemorrhage from a pelvic fracture significantly contributes to mortality and morbidity in patients with a blunt traumatic bladder injury. When the ruptured bladder is surgically repaired, a critical tamponade may be lost and there is also a great risk of inducing additional bleeding (7). On the other hand, delaying the repair of the bladder and temporal uroascites for several hours normally has no negative consequences (2). In the current case report, no intravesical bone spicules were detected by CT and a laparotomy was not needed for any other abdominal organ injury. According to abovementioned reasons, a surgical repair of the intraperitoneal bladder rupture for first several hours was avoided. However, if a bone spicule had perforated the bladder, it would have been removed surgically to prevent an infection and help the bladder heal (4). Furthermore, it was recognized that when a laparotomy is performed for other types of abdominal organ injuries, the bladder may be surgically repaired at the same time. According to his hemodynamic condition and soft abdomen, it was decided to continue the conservative treatment since it was considered that a surgical repair would result in a higher risk of infections and additional bleeding. In the current case, CT and sonography showed good urine drainage and no intraperitoneal fluid. However, since urine could be drained constantly, without any interruption, the conservative management was continued. A blunt traumatic intraperitoneal bladder rupture usually includes extensive lacerations (4). Retrograde cystography showed leakage of the contrast medium into the abdominal cavity without distention of the bladder, suggesting that the laceration was not small. In conservative treatment, constant urine drainage is as important as the size of laceration. Although the size of laceration was unclear, it was decided to continue conservative treatment, since urine was constantly drained and no uroascites were detected. Although there is still no standard conservative treatment for IPR, it was believed that the duration of drainage was 7 - 14 days, and cystography was suggested prior to removing the catheter. The most important part of treating IPR is complete drainage. This can be achieved by urethral catheter indwelling and/or percutaneous peritoneal drainage (4). Conservative management protects the patient from anesthetic risks and surgical complications. However, the indications of surgical repair are improper bladder drainage, deterioration of the general condition in the first few hours, prolonged urinary drainage through the peritoneal drain, lack of clinical or laboratory improvement and concomitant injuries that need laparotomy. Although the patient in the current case had post-traumatic IPR, he had no signs of generalized peritonitis and his condition improved with Foley catheter insertion alone. Therefore, it was decided not to perform surgery. After 14 days of urine drainage by urethral catheter, cystography revealed no extravasation, therefore, the catheter was removed. The patient did not have any complications after five months of follow-up. In conclusion, the presented case of post-traumatic intraperitoneal bladder rupture was treated successfully by inserting a Foley catheter alone. Although the IPR treatment procedure is not changed much for more than 30 years, some case reports and series suggested that conservative treatment in highly selective patients may have its place. Non-operative management for a blunt traumatic intraperitoneal bladder rupture with a severe pelvic fracture is an important treatment modality to carry out damage control for a severe pelvic fracture. Non-operative management can be continued under the following conditions: 1) a laparotomy is not needed for any other abdominal organ injuries; 2) no intravesical bone spicules are detected; 3) urine can be constantly drained through a transurethral catheter; and 4) a close surveillance for generalized peritoneal signs and uroascites can be performed. Authors would like to thank Dr. Ramin Kafshgari and the clinical research development center staff of Shahid Beheshti hospital in Babol, Iran, for their cooperation. Conflict of Interest: There is no conflict of interest and grant support regarding the current paper.